Almost three weeks in to this journey, walking was a part of me. This familiarity allowed me to notice small distinctions in pace – the body’s speed, how the mind races, and a glimpse into the slow, steady rhythm of a trusting heart. Considering that I often race through my daily life, learning to play with pace as a pilgrim bestowed a number of insights I use in my life. Muriel and I left Hontanas in the morning under threatening skies toward the heart of the meseta. We walked into the scenery I’d sketched the day previous among wheat fields and wildflowers (including a purple poppy!). The path followed a little-used street then over an ancient Roman road which turned into a long, slow climb up the side of a mesa. The ascent seemed endless and the wind blustered around us. I kept thinking we were at the top, but another bend would reveal more upward path. How I wanted to reach the top. How I longed to be done with the work and just rest. How often in life do I want to already be at the finish line instead of where I am? Right now is where the potential for joy exists, not up ahead of me at some arbitrary viewpoint. No amount of yearning or suffering can get me there. I want to stop deferring my life for the comfortable seat at the end. I want to feel happy now! The other side was a descent on a concrete path and I walked as quickly as I could to get warm. En route, I noticed a memorial to a pilgrim who’d died in this very place. These reminders dot the entire Camino and gave me pause to reflect on how they died doing something courageous. The made me assess whether, if I died now, would I be content with my life so far? This is a powerful thing to ponder. Slowing down allows you to receive kindness and love. Further down the road, Muriel and I walked into sleepy Castrojeriz to buy bananas, oranges, and cheese. When we finished in the little shop, we got turned around trying to find an ATM. The streets and alleys looked the same and signage was (like in most Spanish towns) creatively disguised on mosaic tiles high on the second stories of random buildings. “Cajero automático,” we told him. It was as if he’d been waiting all day for us to show up. He moved between us, offered us each an arm, and together the three of us took a slow, gentle stroll along the high street, overlooking this town on a hill. When we reached the stone steps that descended steeply in the direction of both the ATM and the Camino, he gave us the directions in Spanish three times with accompanying gestures. We thanked him profusely. He wished us a buen Camino and gave us both a kiss on the cheek. That never would have happened had I been rushing and impatient. Bad “story” = bad outcomes. Positive “story” = better outcomes. 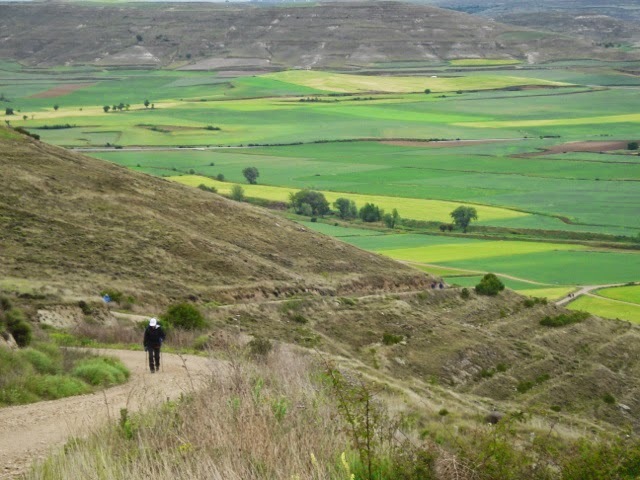 The Camino near Itero de la Vega takes a sharp right off the main road. We were so entranced by the lovely bridge over the Itero river and the Italian albergue on the side of the path, we almost missed it. Muriel and I stopped to consult our guidebooks to be sure – yes, turn right. Just ahead of us were two pilgrims we’d met earlier who were now off the Camino. So I dropped my pack and ran. My efforts to shout to them failed because the wind carried the sound of my voice backwards away from them. I had to get closer. I ran for a half-mile before I flagged them down. They were so grateful. I was proud of my feat (and feet)! The interesting lesson I got from this surge of activity was how my thinking affected my body. When I started to feel pressure in my lungs, I very clearly told myself, “I can’t do this. It’s too hard.” Immediately, the energy drained from my body and I started to walk. But at this pace I would never have caught up to them. I tried something different. I began to run again and told myself, “You can do this. You are strong!” I thought about how I loved to run as a child. Suddenly, new energy burst through me and I kept going — even after having walked all day. What a difference one’s thoughts make! Drama and fearful thinking are optional. There’s a palpable energy that some people are giving off about finishing, racing, competing to get up sooner and get there faster. It’s based in fear. It’s based on the belief that there’s not enough. And I’ve been buying into it… until today. This morning I told the Divine, “I place myself in Your hands. Whatever happens is for the best.” In other words, I trust. I’m not going to race. I’m opting out of the fear others have that there won’t be a bed. I’m not going to allow their fear to compromise my own knowing that I am safe. I surrender to the will of the Divine. How useful would be to apply this concept in my daily life. Yes, it’s important to show up and do my part, but there is so much in life I cannot control. Fighting it just makes me miserable. Surrendering is the sweetest choice I can make if I want to live a life of meaning. Here’s the best part. Without worrying or racing, Muriel and I got a private room for two for just 8€ each without a reservation. So much for scarcity. At dinner, I sat across the table from an 80 year old pilgrim who was a missionary. Talking with him was such a blessing. He didn’t try to convert me or save me or press an agenda on me. He just said, “You just need to take life into your own hands.” Thanks, Universe. I needed that. If my life is indeed in my hands, then I choose to release to Spirit what isn’t mine to grasp and trust Divine timing to reveal my path.